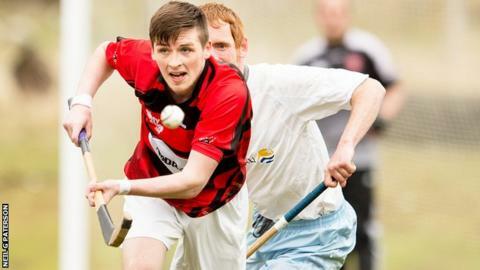 The new shinty season gets underway on Saturday with any number of areas of intrigue to whet the appetite. Among last season's highlights was Lovat's sensational Camanachd Cup win after waiting 62 years to lift the famous trophy. The stand out performer in the final was Lovat goalkeeper Stuart Macdonald, who had arguably the performance of his life as his side ran out 2-1 winners. Falling at the final hurdle has left a sense of determination in Kyles Athletic striker Roddy Macdonald to go after what he sees as the ultimate prize once again. "We couldn't have done a lot more on the day to win," said Macdonald, who described namesake Stuart's performance as "outstanding". "Everything went right for him, a fantastic performance. He's a great goalkeeper. We knew it would be difficult to beat him but maybe not that difficult. "We want to win the Camanachd Cup. We'll push Newtonmore for the league again, we won't be far away. Hopefully, if we can keep boys fit we'll be in with a shout. "The league is always going to be difficult for us. We've got a small squad and a couple of people missing really affects us. "We don't have the power of Newtonmore to bring players in." Most onlookers expect Newtonmore to be too strong once again in the Premiership at least, but shinty commentator Hugh Dan MacLennan believes a real source of interest will be how Skye acquit themselves in the top division after promotion. "They've offered so much potential over the years," said MacLennan. "Now they've finally made the big step. "They obviously won the cup way back in 1990 but there is no test like an annual programme of a full season in the premier league." More's captain Steven MacDonald believes Skye can prosper. "I can see them fitting in pretty well," he said. "It's a tough place to go. It's a long journey for most teams. "They're a good young team and they do have some really good forwards." Newtonmore are looking to extend their run of Premiership titles to seven in a row, something MacDonald prioritises despite the lure of the Camanachd Cup. "It'd be great to win it but I'm more personally into the league," MacDonald explained. "The team that wins the league has been the most consistent throughout the year. The cup is a bit of a lottery." MacDonald did taste victory in the Camanachd Cup in 2011. "At the time I didn't know how big it was to the town because I hadn't been playing shinty that long," he recounted. "When we won the game against Kingussie 4-3 - seeing grown men cry, it was surreal emotions. "It's good to see Newtonmore finally the way they were back in the 70s/80s. We're starting to breed quite a lot of young boys who are really keen to play shinty. "That's all we can do, keep getting the young ones coming in, get them into the first team and try and win as much as we can." The name Kingussie is perhaps the most recognisable to those with a passing interest in the game and there was a sense of disbelief that the once dominant club had to win a play-off to stay in the top tier last season. They achieved that and MacLennan is optimistic they will not experience the same sort of pressure this time around. "All credit to them for getting out of it as they were in dire straits," he said. "It was an unprecedented position to be in. "They bought themselves time and the important thing is they've built on that during the close season. I think they'll be more comfortable this year. I don't expect them to be in the same position come the end of the season." The start of the season has been overshadowed by the postponement Kinlochshiel v Newtonmore due to bereavement. There's also concern over the state of playing surfaces given the fairly atrocious weather in the run-up to the first weekend of the season. A real challenge exists in getting games played to avoid a backlog further down the road. But that's far from the minds of players and fans as another season begins with renewed opportunities.